Episode 28- Tell me, have you ever been saved by an Orc? Episode 28 of Inter-Party Conflict is here. In this episode we discuss alignments and how to go against them, as well as lots of resources for helping with your game. I also want to take a brief moment to direct you all to our buddies over at Crit Academy- they're a great podcast I think you would all benefit from listening to. I haven't got a ton else to say at the moment, but thank you all for listening and telling your friends about the show. We've had some record-breaking numbers over the last couple weeks, and it's all because of you! So keep up the good work. Oh! I almost forgot to mention. This episode marks the introduction of a new segment, the Funeral Pyre. If you have any interesting stories about player character deaths, send them to us (along with any questions or magic items) to InterPartyConflict@gmail.com and we may use them on future episodes! Try to keep Funeral Pyre stories short if you can, but we can always trim them down if need be. So thanks again, and I hope you enjoy the show! 1. What are some ways to show players that alignment is not a concrete thing and to stop hastily making assumptions when they see a monster? 2. What are some tools or resources you use to help run a game? Donjon- I'd heard of this but never used it, and it kept coming up while searching for resources. This site has generators for just about everything- names, cities, taverns, entire adventures, for multiple different editions of the game, too. Definitely a great resource. The image board I mentioned- be warned, this link is NOT safe for work, and I strongly recommend using an adblocker. Reddit's Imaginary Image network- I've found a link that combines all of the /r/Imaginary subreddits (ImaginaryCharacters, ImaginaryLandscapes, ImaginaryMonsters, etc.). Great for inspiration and portraits. A Fellowship has been born! Attention, everyone! 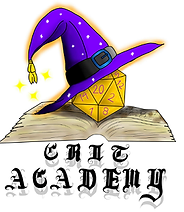 I am pleased to announce that we have been made Fellowship members with the amazing podcast, Crit Academy. I've talked about them several times on Inter-Party Conflict in the past few episodes, but I just wanted to direct anyone that hasn't listened to them to check them out. They're a great resource for character concepts, monster ideas, magic items, and anything you could need to take your game from being good to being great. Go to their website (Http://www.critacademy.com) to see what they're all about, and if you sign up through their form, you can actually win things just by listening! And, hopefully, you'll have a great time on the way. I'll be putting a permanent link somewhere here on the blog, but until then I just wanted to tell everyone what's going on. So as Justin would say, keep your blades sharp and spells prepared, heroes! In this week's episode we talk about killing your players because they don't know how to play the game, telling other players at the table what to do, making your puzzles impossible, and tacking on extra plot twists to pad out the campaign. (Or... wait, maybe those were the other way around. Is it opposite day? No? Then that means yes?) We also have another item from Justin at Crit Academy, and hopefully no sound issues this time. One thing I should note: There's been a buzz around the proverbial water cooler that supposedly Soundcloud is having issues. If that's true and not just rumor, then that will probably mean some changes for us in the future, though I'm not certain exactly what. I'll play it by ear and let you all know whenever I know- though I doubt it will mean much of a change (beyond me having to go back and edit thirty or more links in the blog here...). Anyway, I hope you enjoy this (tangent-filled) episode, and thanks for listening! 1. As the DM is it my responsibility to make sure characters are playing to the best of their ability or should I let the other party members sort that out? Should I run combat encounters in a more forgiving manner or play on the side of realism? 2. As a player, how do you discourage another player from hogging the spotlight constantly but do so with tact? 3. When creating a puzzle or riddle for the players, should I always have a backup ready in case they can't solve the puzzle or should I offer hints until they do? 4. What do you feel about campaigns having plot twists that make the game longer? Episode 26- and a surprise milestone! Hey, everyone! It's another week, and another episode of Inter-Party Conflict. We discuss finding a group, using the same monster over and over, taking initiative and developing characters and campaigns. We had some (very minor) audio issues during this episode, but I put a disclaimer at the beginning just in case it bothers anyone. I'm also going to be looking into creating a custom website for us- as utilitarian as this blog is, I'll be the first to admit it doesn't look all that great and after finding out how Justin at Crit Academy designed their website I'm going to try and make one too. So keep your fingers crossed that we might have one in the upcoming weeks. In this episode (way at the end) I also mention a new segment that I'd like to include! It's going to be called the Funeral Pyre, and we'll be reading listener stories about a memorable character death. It could be your first character death, or one where the dice stabbed you in the back, or just one where your character went out in a blaze of glory. If you have any character death stories you want to share, or if you want to submit an item for the Dragon's Hoard, or you have questions for us to discuss, please send them to InterPartyConflict@gmail.com! 1. What is the best way to go about finding or starting a game? 2. Are there any methods you can recommend to make rolling for initiative simpler? Also have you ever had a DM or been a DM who keeps forgetting a player's turn frequently and is there a trick to correcting this habit? 3. 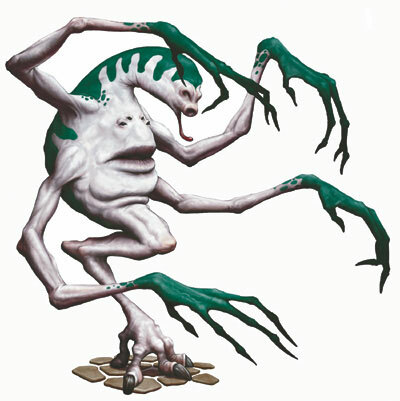 As a DM, how does one break out of the habit of just using the same type of monster over and over? 4. How do you plan out your campaigns? What do you think is the best way to plan out a campaign? 5. What are some ways to get players to develop their characters more? Should I let players be as two dimensional as they like if they are having fun? In this episode, I mentioned a monster called the Gravorg from the 3rd Edition Monster Manual 2. Click this link for its stats and description; once you've done that, Click Here for the official artwork depicting one. Something about the two seems a bit off. 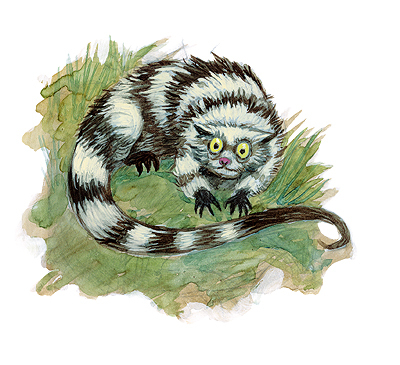 Monster in my Podcast, a small-servings podcast going through the 2nd Edition Monster Manual. It's also part of the Duckfeed.tv podcasting network, which has provided me with literally hundreds of hours of free gaming-related podcasts. Episode 25- we've been doing this for half a year! 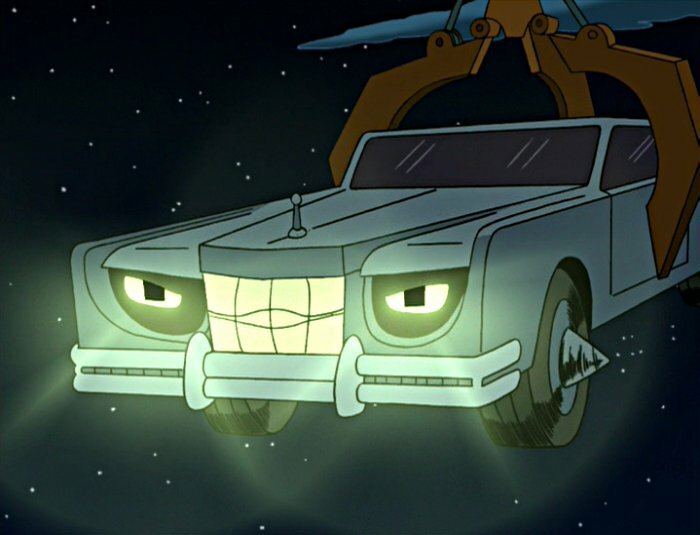 I forgot to mention it while we were recording, but this week's episode marks the 6 month point from when we started. Six months! Half of a year! The time flies when you're having fun (and, incidentally, it flies when you're editing a podcast twice because Audacity crashed; time flying isn't a good thing when you have to get up early the next morning). So wherever you are reading this or listening to the episode, kick back and enjoy a can of RC Cola and celebrate the half-anniversary of what I hope is your favorite tabletop gaming advice podcast. This week's episode deals with fudging dice, paintings of dragons, tieflings that aren't demons and breaking ribs because the DM told you so. Give us a listen, tell your friends about us, and if you have any questions for future episodes or items for the Dragon's Hoard, submit them to InterPartyConflict@gmail.com! 1. Should the DM fudge dice rolls, and if so, when is it appropriate? 2. How do you address a DM who you feel has ruined an encounter by not so discreetly fudging rolls? 3. Are there any elements of D&D that you don't think fit into the setting? 4. What are your thoughts on the DM tracking [player] hit points and not relaying numbers to the players, but instead relying on vivid descriptions?